Commit only a limited amount of time to writing. I suggest no more than 30 minutes a day. Speak with your family, or travel companions, and let them know you will be working — for no more than 30 minutes — during this time. The benefit of ‘enrolling’ them in your writing plan is that it will act as an external commitment to you (making you more likely to do the work). Also, it should help turn them into a support team rather than people who want to sabotage your plans. When I was recently on holiday with my husband, he took a bike ride most mornings when I did my 30 minutes. We were both happy! Resolve to feel no guilt, whether you do the work or not. Vacations can be unpredictable and this no-guilt rule is your escape hatch. Don’t be afraid to take advantage of it. Plan a reward for yourself should you manage to achieve your goal. This reward could be something you enjoy on your holiday — perhaps a dinner out or a visit to a particularly interesting museum — or something when you return home — maybe an expensive book or a piece of clothing you want. Don’t skimp on rewards! They are important and valuable motivators. 3-If you plan to take some time off from writing, don’t expect to resume your old productivity immediately on your return. Writing is like exercise. If you regularly run 10-kms and then take a break for two weeks, you wouldn’t expect to resume 10-kms right away, would you? Fourteen days of inactivity will cause your muscles to atrophy. That’s not a crisis. It’s just something that calls for a recovery plan. Similarly, for writing, if you’ve had the habit of writing 350 words in 30 minutes before your break, be aware that you will not be able to resume that rate the moment return to work. In fact, it will likely take several weeks (perhaps longer!) to reacclimatize yourself to the rigours of writing. This type of decline doesn’t mean you’re a bad writer, or a slow learner or inept. Nor does it mean you’ve made a mistake by taking time off. It’s just an entirely normal period of adjustment that you should plan for and expect. I’m sorry I can’t give you a yes or no answer as to whether you should write on your holiday. There are pros and cons to each side. Trust yourself to figure out the answer that will work best for you. Then, execute your decision with a calm confidence that will assure everyone — including yourself — that you’ve headed down the right path. I’m now accepting applications for the next term of my Get It Done program, aimed at book and thesis writers, starting July 1. There are only two spots left. If you’re interested, apply now. 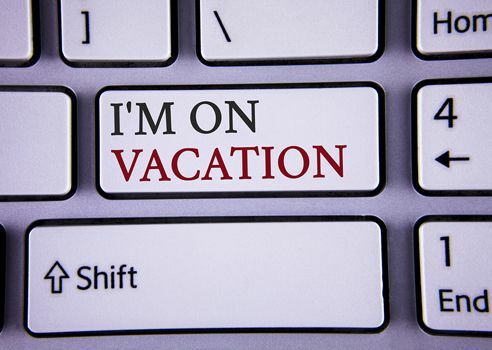 Do you choose to write or to take a full-on break when you’re on holiday? We can all learn from each other so, please, share your thoughts with my readers and me in the “comments” section below. And congratulations to Lori Bogdanis, the winner of this month’s book prize, 59 Seconds by Richard Wisemanfor a May 23/18 comment on my blog. Anyone who comments on today’s post (or any others) by June 30/18 will be put in a draw for a copy of Between You & Me: Confessions of a Comma Queen, by Mary Norris. To leave your own comment, please, scroll down to the section, directly underneath the “related posts” links, below. Note that you don’t have to join the commenting software to post. See here to learn how to post as a guest.